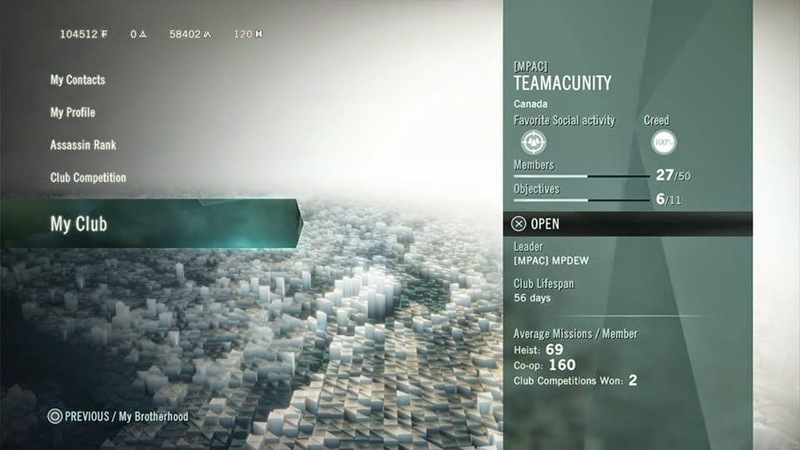 Dr Jengo's World: AC Unity - Club Competitions. Join me! Hey! Anyone actively playing Assassin's Creed Unity on the PS4 and looking for an active club to join? Well if you are, come join my friend's club, TeamACUnity. We have been very active in the Club Competitions and dominating them as well, winning both of the previous Club Competitions. Each CC unlocks one of the several Legendary Gear that are locked in the game so if you are looking to unlock those elite stuff, do come join us. We just request you to be active and contribute as much as possible if you can. Just add me on PSN (Jengoboy) or my friend, Mathieu (MPDEW) and request for an invite to the club. Or you can just search for the club with these info.. So, if you are actively playing.. don't let your effort go to waste with a mediocre club, join us and go for 1st prize each week!